In a recent CAPA report on an airport cities conference, the contribution of Ms Saxen Van Coller, the CEO of the Dube Tradeport near Durban, South Africa, was especially notable. After describing the development of an aerotropolis around the airport, she said that Africa had been lagging behind in this field but agreements had been signed recently that will lead to other aerotropolises in South Africa. Furthermore, she insisted that Europe is overlooking opportunities in Africa generally and that, fundamentally, better international and intercontinental connectivity is essential to the prospects for this particular development, and for others. The Dube Tradeport benefits from the proximity of two major southern Africa ports as well as the King Shaka airport, which is a rare occurrence on the continent, but is she correct to say that Europe or anywhere else is overlooking serious airport and airport-related business opportunities there? The next major destination for business and tourism - hope or promise? In some economists’ estimation Africa has grown in emphasis as the world’s next major destination for both business and tourism, thereby offering opportunities to create regional and international travel hubs there. But safety, security, and transportation costs still remain high on the agenda for aviation professionals in Africa, as do health issues such as the recent and rapidly spreading Ebola haemorrhagic fever outbreak in West Africa, over which they have little control. Then there are rapidly changing technologies to contend with, together with a drive to improve regional competitiveness. This has created a need for smart solutions for the development of African airports, in both construction and technology. On the other hand it is not just airports;Africa is not at the top of the list for infrastructure investment in general. In a table drawn up by the OECD, the top ranking African country for investment out of 40 globally was Nigeria (#35). By way of introduction to the advances that Africa has made or failed to make in recent years it is pertinent to look at some interesting statistics. Air transport in Africa has admittedly suffered from several decades of lack of investment, lack of strategic vision and tactical mismanagement, leading to decaying infrastructure, outdated equipment and unsafe systems on the ground and in the air. A turning point came some 10 years ago when international organisations that help fund essential infrastructure such as regional development banks and global ones such as the World Bank/International Finance Corporation began to demand outright transparency and accountability from the recipients of such aid. That change in accountability went hand in hand with development and economic growth across the continent that has been sponsored by large scale investments across the industrial and commercial spectrum from at least two of the BRICs – China, and latterly Brazil. (And it should be noted that in the opinion of some economists South Africa at least is considered to be an ‘affiliate BRIC’ as a significant emerging market in its own right). This has provided some stimulus for investment in airport infrastructure in some parts of Africa as national governments recognise the essential need for facilities that meet international standards as well as handling expected increases in passenger numbers and aircraft movements. While much of that infrastructure is still financed from local public sources where it can be justified, or from international financial aid, private sector involvement has gained some momentum. 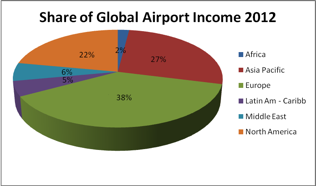 However, despite this recent growth the African continent only accounts for 2.85% of the global total of passengers transported and only 2% of global airport income (see chart below) in spite of being the second largest and second most populous continent. Meanwhile only two African airports (Johannesburg’s OR Tambo International and Cairo International) are featured in the top 150 airports in the world in terms of annual passengers handled; and not coincidentally they are located at either end (north/south) of the continent with much weaker levels of activity in the vast void between them and especially so on an east-west basis. ...Lack of passenger volume at many African airports; inadequate experience of non-aeronautical revenue generation; and lack of financial opportunity amongst the indigenous population to spend. Economic growth: Seven of the world's 10 fastest-growing economies will be in Africa and sub-Saharan Africa in particular. But it still remains the case that the disadvantages outweigh the benefits for most investors. As a consequence, there is still little evidence of privatisation activity and few investors who have identified Africa as ‘the place to be’ in 2014 or 2015 despite positive macroeconomic indicators. Nevertheless, some of the states are trying, including Ghana, which has attempted a series of PPP transactions to improve major airports such as Kotoka Airport in Accra (the only international one), and Tamale Airport (where a USD100 million deal was signed) as well as the construction of airports at Princess Town and Ankaful, again with the assistance of private funding. There is also talk of Chinese interest in constructing a new Accra airport at Dangme West District. If and when the private sector becomes more involved it might expect to take minority stakes similar to those found in the PPPs to date in India, which has become a sort of role model for the developing world, and which is about 10% per investor/operator with the state authority remaining the largest investor, though not with 51% or more of the equity. It is hard to envisage any outright lease or sale transactions yet; these are construction driven investment projects where the private sector participants may well be satisfied initially with their fee for the project plus a small royalty on income, while seeking to gain more in later years. But Ghana is certainly more active and forward thinking in this respect than most African countries right now, many of which covet private investment but do little to prove their real value to investors. The state of the economy there also looks to be positive. The success or otherwise of start-up LCCs like FastJet will undoubtedly have a bearing on how non-African firms perceive aviation activities in Africa. It is quite possible that organisations with funds available but few prospective targets in Europe might be attracted to give Africa a go. There is some scope for further privatisation of airports in South Africa outside of the ACSA (state operator) system. The existing ones include Lanseria, between Johannesburg and Pretoria, and the Kruger National Park airport at Mpumalanga. Late in 2013 executives in the KwaZulu-Natal province invited the private sector to consider opportunities at airports in the province, the provincial government having itself invested ZAR140 million (USD13.8 million) in airport upgrades, including projects at five airports, none of them under the auspices of ACSA. The rationale is that many of the airports have large tracts of land around them that can be developed into industrial/commercial or tourist facilities. The latest proposal for a privatisation (Jun-2014) is the Wonderboom Airport just north of Pretoria while the Skukuza Airport Management Company, a PPP comprising regional airline SA Airlink, Lion Sands and Federal Air and SANParks, the South African National Parks Company, was formed to oversee the refurbishment and enhancement of Skukuza Airport's runway and terminal buildings to enable airline services. Meanwhile, ACSA, which is part of a consortium that manages and develops Brazil's Sao Paulo Guarulhos Airport as well as being a 10% shareholder in Mumbai Airport, has been in discussions with several countries in Africa as part of plans to expand its investments in the region. ACSA plans to submit a strategy for the acquisition of stakes in African airports with the aim of increasing revenue and improving African airport infrastructure generally. The plan will likely be similar in nature to the company's involvement in Mumbai and Sao Paulo. Despite this, the government will consider a bill designed to increase private sector participation in the construction and maintenance of airports, as well as the potential privatisation of airports in the country. 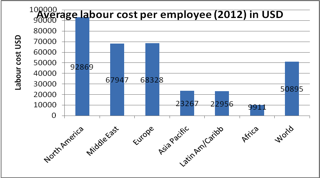 Returning to employment issues in Nigeria, actually, in many cases in Africa potential investors have little to fear by way of over-manning and other cost issues as the average labour cost per employee (2012) was less than USD10,000, or half that of the next lowest world region (Latin America). Private capital has also been sought for the construction of permanent and interim (following a fire) terminals at Kenya’s Nairobi Jomo Kenyatta Airport, while the Tanzania Aviation Authority is seeking an investment partner to fund a TZS225 billion (USD135 million) extension to a new passenger terminal at Dar Es Salaam International Airport. In the same region Uganda’s government agreed to seek external financing for projects to upgrade several airports including Entebbe International Airport to international standards, which means the capability to handle aircraft such as the A380. Which airports are likely to attract investors if governments seek them? Inevitably they will be the larger ones with more solid traffic flows and a broad mix of carrier types to reduce risk just as is the case in Europe, Asia Pacific, and the Americas, and especially where it is hoped to catch the attention of investment, pension and sovereign wealth funds. There are, however, few large airports in Africa. The largest are at least split more equably between the north, south, east and west although the north and south of the continent still predominate. The air transport hub of Southern Africa, and is Africa’s biggest and busiest airport. The airport plays a key role in the Gauteng province’s economy. The airport’s infrastructure has been expanded by thousands of square metres in recent years prior to the 2010 World Cup but charges to airlines subsequently rose dramatically. Part of ACSA, it hosts airlines from all five continents. Egypt’s largest airport and the second busiest airport in Africa, with over 65 airlines using it annually. The airport has three terminals and a new cargo terminal. An airport city development is planned. The airport has an area of 37 sq km. Africa’s third largest airport, located approximately 20km from Cape Town city centre. It has established a reputation as an award-winning airport in terms of customer service. The airport has also gained praise for its unique split-level design. Operated by ONDA (National Airports Office), the airport is located 30km southeast of Casablanca and is the busiest airport in Morocco, a country that has embraced low cost services from Europe and the Middle East in collaboration with its tourist industry. Located 5km southwest of El Dahar, Hurghada Airport is currently served by one terminal. However, construction of a new terminal complex with an annual passenger capacity of 7.5 million is currently underway and is expected to be completed in Oct-2014. Located in Lagos, Nigeria, it is the major airport serving the country. The airport’s international terminal was modelled after Amsterdam Airport Schiphol. It is the main base for Nigeria’s flag carrier airlines, Air Nigeria (now defunct), First Nation and Arik Air. The second busiest airport in Egypt after Cairo International Airport, attracting European and US visitors to a major Red Sea resort. In 2008, the Egyptian Airports Holding Company announced plans to build a third new terminal at the airport which will double its capacity from 10 to 18 million passengers per year. It is scheduled for completion in 2015 but has been delayed by funding issues. The airport is located in the Bole area, 6 km (3.7 mi) southeast of the city centre. It is the main hub for Ethiopian Airlines, the state airline that serves destinations in Ethiopia and throughout the African continent, as well as non-stop service to Asia, Europe, North America and South America; one of the few Africa carriers that can compete directly with non-African ones like Emirates and THY. The airport is capable of accommodating the A380. Ethiopian Airports Enterprise commenced the third and final phase of a USD550 million expansion of the airport in Jun-2014 and intends to complete the project within three years. The project will be undertaken by China Communications Construction Company with USD250 million in funding provided by Export-Import Bank of China. A new airport for the city remains under review at one of several sites, and again with financial participation from China. Jomo Kenyatta International Airport is located in the Embakasi suburb, 15 kilometres (9 miles) southeast of Nairobi's central business district. It has scheduled flights to destinations in over 50 countries. It is building a temporary terminal as a result of a fire in 2013 and a USD627 million new green field terminal, as it vies with Addis Ababa’s Bole Airport for regional (East African) pre-eminence. Also known as La Mercy Airport, King Shaka is the primary airport serving Durban, South Africa. Located approximately 35km north of the city, it opened to passengers on 01-May-2010, just over a month before the start of the 2010 FIFA World Cup. There is an airport city and associated aerotropolis around the airport site, one of the most significant in Africa. Nnamdi Azikiwe International is the main airport serving the Nigerian capital city. It consists of an international and a domestic terminal. Both terminals share the same runway. The development of a new terminal for the airport is due to be completed in approximately two years. Work on the terminal commenced in Mar-2014. Financing is being provided by a Chinese development loan, as well as Nigerian Federal Government funding. Marrakesh Menara Airport serves the capital city of the Marrakesh-Tensift-El Haouz region of Morocco. It is an international facility that receives several European flights (mainly low cost) as well as flights from Casablanca and some of the Arab world nations. Recently, The Minister of Equipment and Transport stated the airport will reach capacity saturation by 2025 and proposed construction of a new Marrakesh airport to meet demand. Several potential sites have been shortlisted within a 30 km radius of the city. The new airport will feature a 3500m x 60m runway and capacity for around 10 million passengers p/a. Infrastructure investment is estimated at EUR380-400 million (USD544 million). Marrakesh-Menara International Airport has capacity for around nine million passengers per annum. Breaking these 12 airports down by type, nine are capital city and/or chief commercial cities while three are better known as tourist resorts, all three of them in the north. There is of course some overlap. Both Cairo and Cape Town can be considered commercial and tourist cities for example. Some of the main airport construction projects taking place in Africa are referred to in the table above. According to the CAPA Airport Construction and Capex database, USD33.8 billion is currently being invested, or is intended to be invested, in construction and associated projects at existing airports on the African continent, in 77 projects spread over nine countries and with an average spend of USD440 million. That figure encompasses major projects such as those already highlighted together with those at, for example, Tripoli (USD2.1 billion); Algiers (USD952 million); Kigali (USD650 million); Lusaka (USD500 million) and Cairo, where projected expenditure of USD18.5 billion includes a massive airport city (see later). It also includes multi-airport projects at smaller facilities in countries such as Angola (USD2.1 billion) and Nigeria (USD1.07 billion). These figures may be conservative. Some airports go out of their way to avoid revealing their capex details. While it is the case that airport capex decreased considerably in Africa in the period 2011-2012 (by 47.6%) and that Africa only accounts for 1% of global airport capex expenditure (see chart), such figures can be misleading. While Asia Pacific’s airport capex decreased by only 14.5% in the same period that figure masks a staggering 80% reduction in India for example. By comparison, Africa fared rather well. 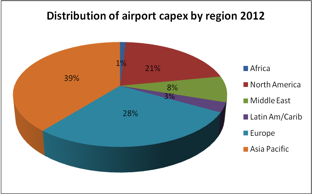 Furthermore it is interesting to note that African airports had in 2012 a high proportion (69%) of their capex allocated to construction as opposed to alternative use on property, plant and equipment purchase; purchase of other goods and services; and ‘other capex items’ – the three other categories. 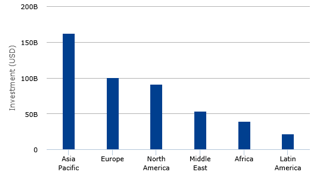 That percentage is above the world average and also that of Asia Pacific and Europe. (The figure for Latin America was 89%, largely accounted for by Brazil’s construction programme for the World Cup. In 2014 there are known to be 40 new airport projects in Africa, some of them multi-million dollar enterprises (including a new one under construction on the tiny island of St Helena that will host its first ever commercial air services) out of a global total of 264, or 15.5% of that total, and with a further expenditure total of USD5.745 billion, to a grand total for Africa of USD39,545 billion. This total expenditure compares to USD162 billion in Asia Pacific; USD100 billion in Europe; USD91 billion in North America; USD53.6 billion in the Middle East; and USD21.7 billion in Latin America.